What is the difference between Fountain Pens, Rollerballs and Ballpoints? Fountain Pens: puts ink to paper using a feeder system and metal nib. Fountain Pens: utilize a cartridge, converter or piston filler system. 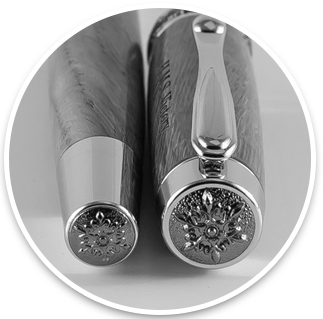 Fountain Pen Nibs: materials use for Nibs include gold, steel, titanium and palladium. Rollerball Pens: use a water-based ink for a smooth writing experience. Rollerball Pens: can create beautiful fine dark even lines but the water-based ink can smear when applied to a glossy surface. Rollerball Pens: typically feature a twist-off or pull-off cap (the easiest way to distinguish a rollerball from a ballpoint). Ballpoint Pens: use petroleum-based ink and is normally smear-free which helps create reliable clean writing. Ballpoint Pens: typically utilize a twist style mechanism (or click mechanism). Ballpoint Pens: being petroleum-based, refills are resistant to drying out. History Salvaged Witness Wood® is the registered trademark of the HistoryPens.com, LLC and History Salvaged. We use our Witness Wood® slogan to describe the unique woods that we work with. These woods in most instances have originated from historic or cultural sites or buildings and have “witnessed” events from points in history that we now only read about. How do I change a Fountain Pen cartridge? History Salvaged’s fountain pens like all fountain pens has four parts when assembled: the Cap, the NIB, the Barrel and the Ink Reservoir. HS’s ink reservoirs contain either a Piston Converter or Ink Cartridge. The piston converter fills with disposable ink while the cartridge is a self contained unit. First remove the cap. Then remove the barrel by turning it counterclockwise. If a piston converter is installed, remove it by gently pulling it away from the nib. To insert the fountain pen cartridge into the nib, simply push firmly until the cartridge seats itself at which time you will hear a click. Contact Us or Email Us.